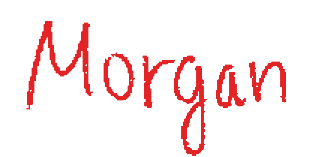 Ya'at'eeh Morgan yinishye. Tsinaajini nishli. Bitaahni bashishchiin. Honaghaani dashicheii. Tl'izi lani dashinali. Hello, my name is Morgan and I am a member of the Navajo Nation. I am of the Black Street Wood Forest People clan, born for the Folded Arm People. My maternal grandparents' clan is the One Who Walks Around, and my paternal grandparents' are the Many Goat clan. My parents are Emerson and Vivian, and I am an only child. I grew up in a border town about 15 miles off the Navajo reservation. I also attended school here. "Having parents that pushed me to do my best in school is what drove me to want to attend college." Neither of my parents possesses a college degree, but did attend some college before deciding to come back home. Although they weren't college graduates themselves, they still held education of high importance. Having parents that pushed me to do my best in school is what drove me to want to attend college. The amount of support I get from them and the rest of my family is what makes me confident that I'll succeed in college. I have a strong cultural identity and connection to my traditions that empowers me and gets me through the hard times. Knowing that I have young ones back home who look up to me is what pushes me to do better and strive to be successful in higher education. In high school, I was a very well rounded student who participated in sports and clubs as well as maintaining good grades. Coming from a rural school right beside the reservation, I experienced quite a culture shock when I came to such a big university. The classes were huge and everyone seemed to know a lot more than I did. I didn't do as well as I hoped I would in my first semester but now that I have adjusted more I feel that I will be able to go back to being a successful all-around student while in college. When I'm having trouble trying to find motivation I think about my family back home who inspired me to go to college in the first place. My younger family members don't have anyone else to look up to as far as college education. I feel that it is my job to inspire them to want to go to college no matter what their own personal situations are like. "I experienced quite a culture shock when I came to such a big university." I selected my major, which is Pre-Physiology, because I knew that this is part of the path that I would need to take to go into the health field. One of the leadership positions that I'll always remember was back when I was in high school during my junior and senior years. I had a College Success class where a few of the students got to help organize and plan various events that educated our community members about the different things you needed to know about applying to college. 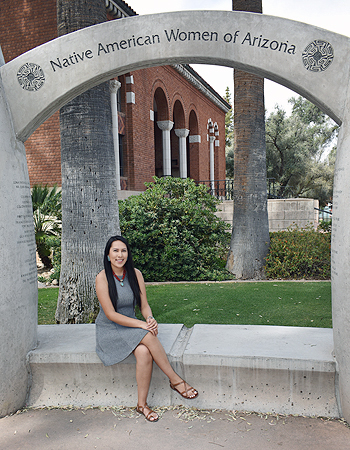 Having an opportunity to educate other Natives in my community about college inspired me to continue helping Native Americans get into higher education. I'm also a part of a Native American wing, called the O'odham Ki Wing, where we all live on the same floor of a dorm. This provides a great support system through the First Year Scholars program that helps minority students have a smooth transition their first year of college. I also have a huge support system consisting of my parents, family, friends, and tribe who all want to see me do well in school. I know I can always look to them when I need an extra ounce of encouragement or motivation if needed. My biggest career goal is to improve the quality of health care that Native Americans are receiving. I hope to become a physician assistant who works in clinics around or near the Navajo Reservation. My main goal is to raise awareness and educate my people about the different types of illnesses that we as Native Americans are predisposed to. By doing this and improving communication between health care provider and patient, I hope to have a positive effect on the health status of my Native American people. Some steps that I plan on taking to reach this goal, besides pursuing an education, include getting EMT certified this summer so that I am able to start working in the hospital to gain some exposure to the health field. I also plan on shadowing/interning in the health field I am interested in so that I can gain more experience. I eventually plan on earning a master's degree that would allow me to become a licensed physician assistant that will be able to work in clinics around the reservation. I see myself being successful as a physician assistant because I am understanding, caring, and empathetic. My faith in my family and culture will help keep me driven and determined to become someone who is able to give back to their Native community. My strengths include being well grounded and optimistic in everything that I do, while my weaknesses include being shy and mellow sometimes which could also be considered a strength. 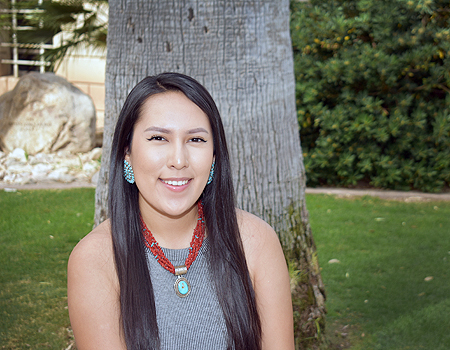 "I eventually plan on earning a master's degree that would allow me to become a licensed physician assistant that will be able to work in clinics around the reservation." My Native American heritage is all about living in harmony and having love and respect for one another. To me, this means helping others in need that may not have the same opportunities or resources you do. This is what leads me to wanting to make positive changes in my Native community such as their paths to higher education and quality of health care that they receive. My college education will give me a platform to inspire the younger generation to go into higher education while also giving me the resources I need to have a career in the health field. My whole career goal is to come back to my Native community, or any Native community, and improve not only their health but also the health care that the Native people are receiving. 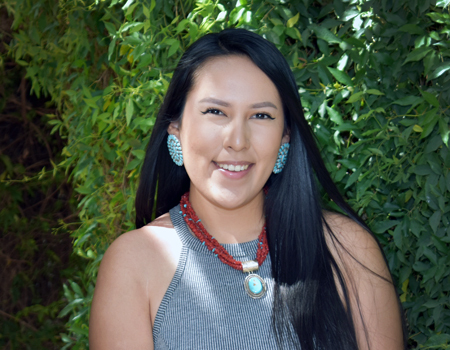 "My whole career goal is to come back to my Native community, or any Native community, and improve not only their health but also the health care that the Native people are receiving." Even though I'm away from home, I've still found ways to involve myself in the Native community. I'm involved in a couple clubs on campus that allow me to socialize with other Native Americans who are also pursuing a higher education. The first one is the Indigicat Student Association, or ISA, which is a student run organization dedicated to bringing together all the Native American students at the U of A. Another club I'm involved with is the Tohono O'odham Student Association, or TOSA, which is more specific to the Tohono O'odham student population on campus. I'm not 0'odham myself but I enjoy learning about another tribe's cultures and traditions. I'm also taking a higher education class called Native SOAR that gives me the opportunity to mentor Native American high school students during their journey to college. 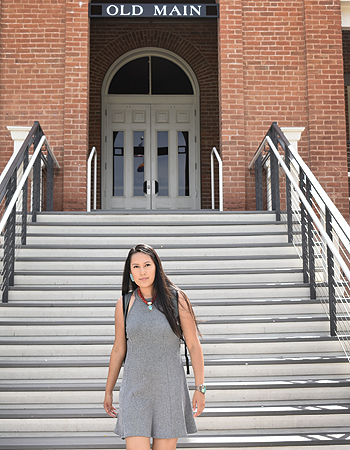 Much like my college success class in high school, Native SOAR allows me to positively influence Native students who are striving to further their education in college. Another club that I've become involved in is the American Indian Medicine and Health Initiative program, or AIM HI, which provides outreach and education to Native American youth and community. We make visits to various school and community events to expose the youth to the health care professions as well as educating them about the different illness and diseases that affect the Native population. These last two programs have really inspired me to continue on my path of education to become a health care provider as well as setting an example for the younger generation to go into higher education. As I begin to plan my second year of college, I plan on being more independent from my parents, financial wise. I've used up most of my college savings fund during my first year of college, alongside the few scholarships that I was able to receive. I plan on living on my own next year in an apartment with some of the friends that I've made here at college. As I become more independent, I also have to think of ways that I can support myself while still going to school to get an education. I've been applying for more scholarships to help lessen the stress of paying for school on my own. I'm also in the process of getting EMT certified that way I can have a job in the hospital throughout the summer and into the school year to help pay for my tuition, books, rent, and other living expenses.